BETTER PRODUCTION MMS FEBRUARY 2018 96 mmsonline.com CUT TING INCONEL Cutoff Saw Creates Blanks from Superalloy in Seconds The superalloy Inconel is valued for its strength and heat resistance, but these properties also make it difficult to machine. Northern A-1 Services, a recycling company with facilities throughout Northern and Western Michigan and in Pennsylvania, needed to saw Inconel barstock without using coolant to create casting charges on a just-in- time (JIT) delivery schedule for an aerospace customer. 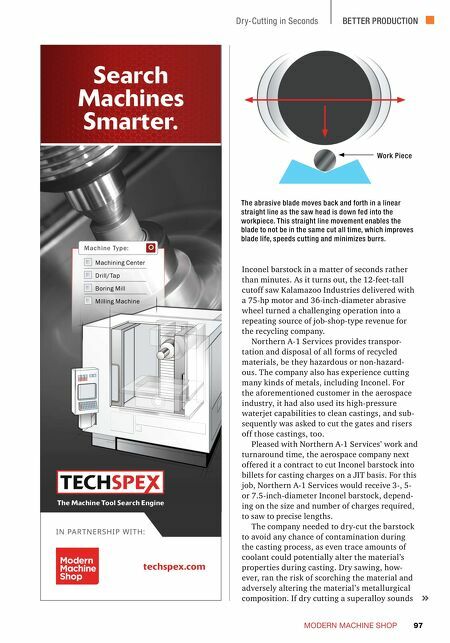 Given the time constraints—and sawing operation in general—the company realized it would need a better cutoff saw than what it had. 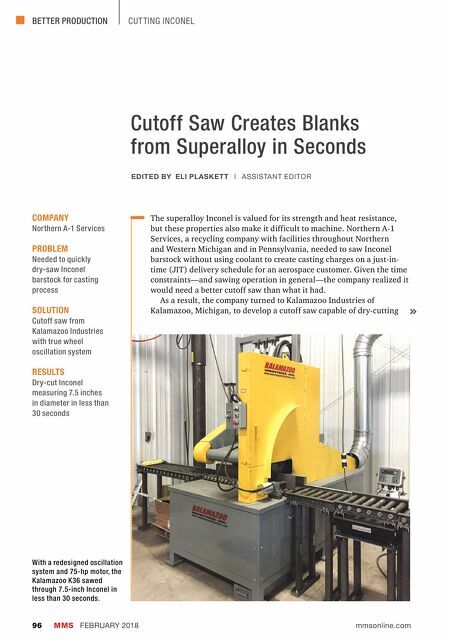 As a result, the company turned to Kalamazoo Industries of Kalamazoo, Michigan, to develop a cutoff saw capable of dry-cutting COMPANY Northern A-1 Services PROBLEM Needed to quickly dry-saw Inconel barstock for casting process SOLUTION Cutoff saw from Kalamazoo Industries with true wheel oscillation system RESULTS Dry-cut Inconel measuring 7.5 inches in diameter in less than 30 seconds EDITED BY ELI PLASKETT | ASSISTANT EDITOR With a redesigned oscillation system and 75-hp motor, the Kalamazoo K36 sawed through 7.5-inch Inconel in less than 30 seconds.